Absent in the media spectacle around Ebola have been the millions of healthcare workers being put directly at risk. Ebola has captivated newsfeeds worldwide over the last several weeks. Now with a confirmed case in New York City, news cycles are more stoked than ever with speculation about how fast the virus will spread through the Big Apple and beyond. Fascination with Ebola is one part genuine concern, and more than a few parts aggrandizement by a 24-hour news cycle hungry for scary stories. Absent in the media spectacle around Ebola have been the millions of healthcare workers being put directly at risk. Unlike Swine Flu and other near-pandemics, Ebola cannot be contracted through airborne pathogens. To become infected, people need to come into direct contact with the fluids of someone not only infected, but exhibiting symptoms. This puts healthcare workers at heightened risk; most of those infected worldwide have contracted the disease while caring for loved ones or patients. The 185,000-member National Nurses United, or NNU, was formed in 2009 out of a merger between three separate healthcare unions. Since its founding, NNU has become the largest nurses’ union in the country and gained a reputation for its commitment to social justice unionism and cross-sector organizing. NNU has staffed healthcare stations at Occupy Wall Street, and last month endorsed and marched in the 400,000-person strong People’s Climate March. They’ve called for higher taxes on corporations to fund Medicare and Medicaid, and been outspoken advocates for single-payer healthcare. It’s also the only union run by and for nurses. Following the first reported case of Ebola on U.S. soil in Dallas, two nurses at Texas Health Presbyterian Hospital came down with the virus. On Friday, both nurses in question, Amber Vinson and Nina Pham, were cleared of the virus. Ebola, though, remains a major threat to healthcare workers. In a press statement on the union’s website, Co-President and registered nurse Jean Ross connected Pham and Vinson’s case to that of nurses nationwide: “No matter where we are working, we are all Dallas nurses now.” In a poll conducted by NNU, 80 percent of nurses reported that their hospitals had given no instruction regarding the admission of potentially infected patients. Eighty-seven percent said that their hospitals hadn’t provided virus-specific education to workers. According to the Occupational Health and Safety Administration, or OHSA, healthcare workers have the highest rate of injury across industries; they’re four times more likely to suffer an injury on the job than manufacturers. The California Nurses Association, NNU’s statewide affiliate, has brought Ebola into its months-long contract negotiations with healthcare provider Kaiser Permanente. It is also calling for increased staffing, training and supplemental coverage should a nurse contract the virus. California nurses’ demands are part of a larger push by NNU to raise the issue of workplace justice in the national conversation around Ebola. 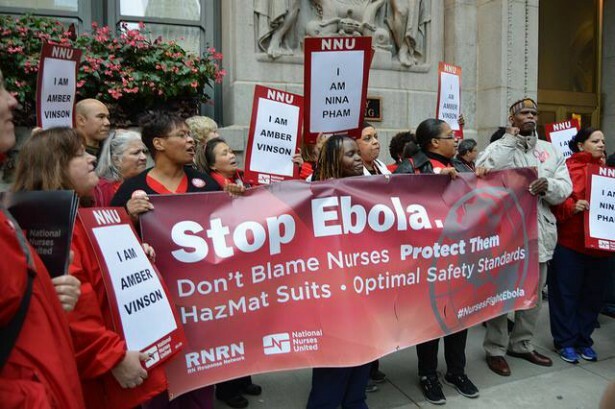 NNU President and former Teamster organizer RoseAnn DeMaro said plainly to nurses in Oakland, Calif., that “If the nurses controlled the resources, there wouldn’t be an Ebola crisis in this country.” Rallies announced at the press conference were held this past week in cities from Ft. Lauderdale, Fla., to Bangor, Maine. The Center for Disease Control, or CDC, issued a report last week about new protocols for hospitals to deal with Ebola. The report is non-binding, meaning that hospitals are under no legal obligation to institute its recommendations. In response, NNU workers are gathering across the country to call on Congress and the Obama administration — working with OSHA — to federally mandate that the highest standards outlined by the CDC are enacted at hospitals to protect healthcare workers and patients alike. Critics have claimed NNU’s actions are an attempt to drive up their membership. That may be true; in light of recent events, nurses’ working conditions are at the center of a fledgling national health crisis. Neither Congress, the CDC nor OSHA are under any obligation to protect nurses’ interests. In advocating for its membership, the NNU might be leading the most hopeful part of the Ebola crisis. Can an app save the American labor movement?